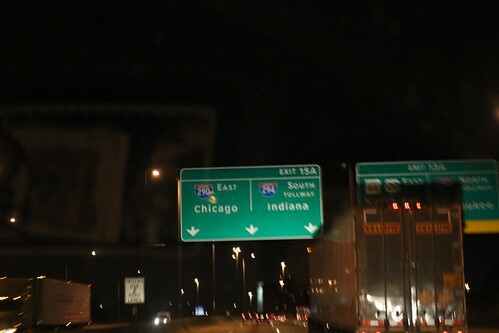 Mali Mish - Day 55: Driving through Chicago at Night. 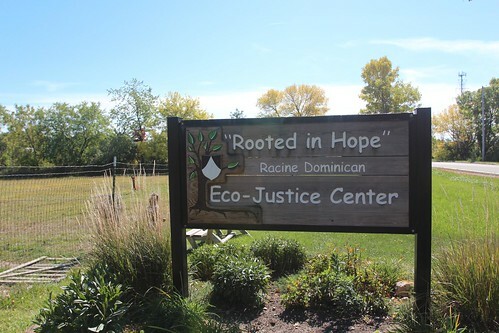 Our time in Wisconsin finally came to an end this morning as we packed up and left Cliffside Park. We had not anticipated spending this much time around Lake Michigan when we left California nearly 2 months ago but we are glad we did. Our original plan was to just head across from Denver to Kentucky but these changes in our plan tend to work out for the best. Our plan today is to drive towards Chicago and find a place to spend the night. 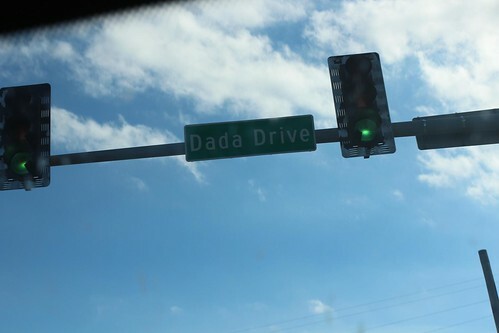 We have heard lots of nightmare stories about driving through the windy city at the wrong time of the day. We are determined to not make that mistake. We are going to take our time and hopefully we will get through the roads without the heaviest traffic late in the evening. We have seen this place just outside of Cliffside Park each time as we drive in and out of the park. 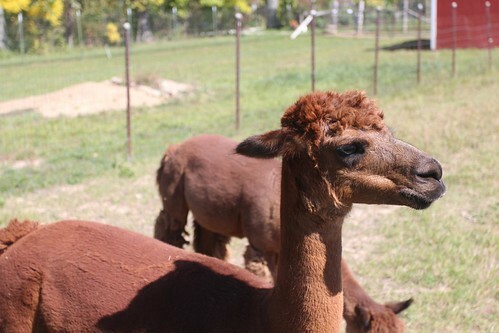 It gets the girls attention because there are alpacas in their yard. 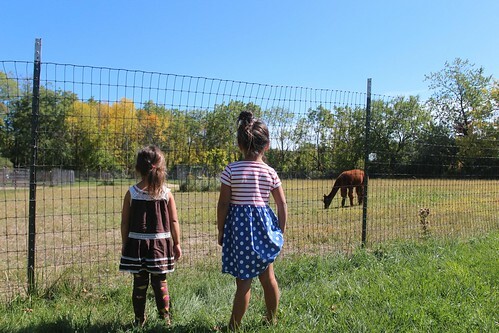 We didn’t have time to stop and pay them a real visit but the girls got to walk up to the fence and say hi to these guys with nice hairdos as we were leaving. Milwaukee is only a few miles from the Wisconsin/Illinois border. One of the problems with visiting Chicago with an RV is that the city is not a very camping friendly place. 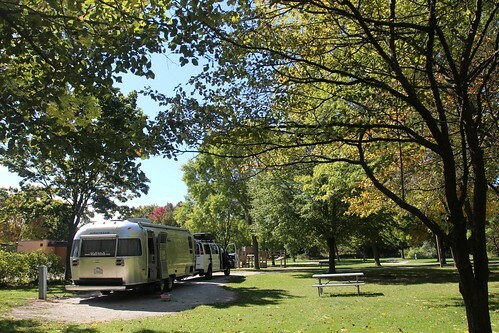 There are hardly any campgrounds near and we have heard from everyone that the best way to visit Chicago with our Airstream is to stay in Indiana. 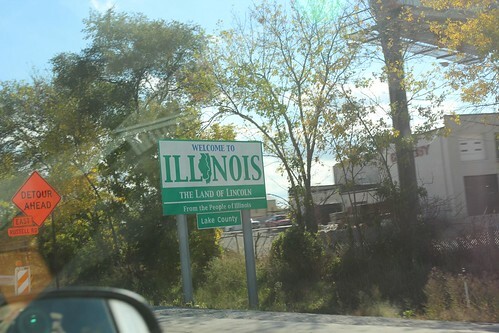 It seems crazy to stay in another state but Chicago is actually within 20 miles of the Indiana border. I have been to Chicago 3 times and Marlene twice but all were in our past lives without Airstreams and kids. This visit will be very interesting. Something we hadn’t considered is all of the toll roads here in Illinois and Indiana. 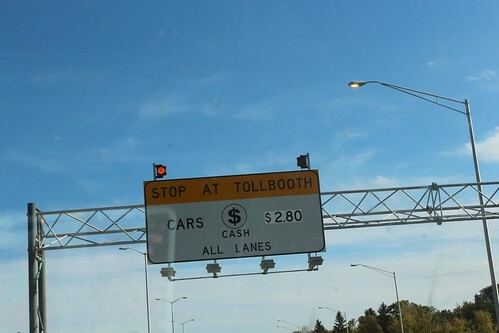 We had not paid a penny in tolls before we got here but just as we crossed the border, we were dinged with a $4.30 toll because of the trailer. If we would have taken the fastet and closest route, we would have shelled out well over $30 in tolls before we got to our destination. A few days after getting my new Internet router and USB stick, I realized that I needed to buy a couple more accessories from 3GStore.com. Knowing that we won’t be in any city for more than a couple of days until Louisville, I didn’t really know where to have it shipped to. And if it started snowing, I wouldn’t want to hangout at this latitude waiting for a package to come. 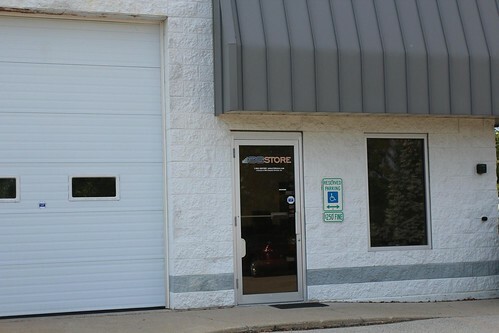 Then I realized that 3GStore.com is warehoused in Cary, IL just outside of Chicago. I immediately placed my order and selected will-call pickup as the delivery option. They got a bit confused with my order since my billing address was in California. I responded and told them that it was not a mistake and I will be by there to pick up my order. We stopped for the afternoon in Cary, Illinois to burn some time so we wouldn’t hit all of the commuter traffic through Chicago. Google Maps had indicated that the 90-mile drive to our destination would take nearly 3 hours considering traffic. We also stopped because Mila had been complaining about her stomach hurting her and as she went inside the Airstream, we also noticed that she was running a fever. Having sick kids on the road is not a fun thing. She curled up into a ball and eventually fell asleep. 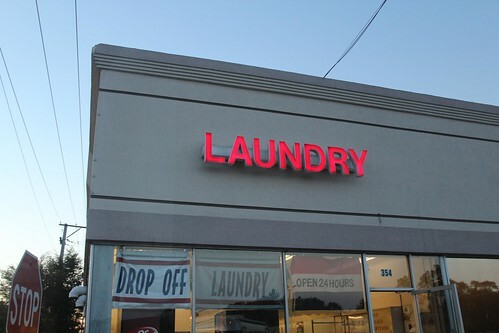 We took this opportunity to also take care of our laundry at the laundromat in this shopping center in Cary. Laundry is not fun to do at home and even less fun being on the road. We got back on the road around 10pm and managed to avoid all of the toll roads. We had to take some county roads for awhile but it didn’t really add that many miles to our trip. As we passed downtown Chicago, there was no traffic at all. This is probably the closest the Mish will ever come to the Sears Tower (Whatcha talkin’ ’bout, Willis?). 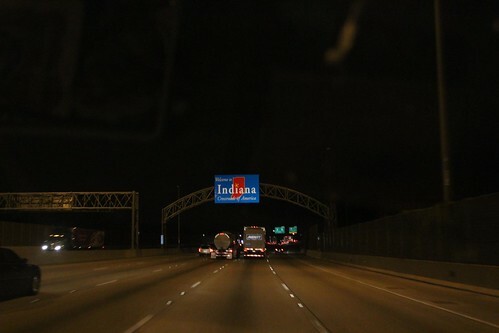 We crossed into Indiana shortly before midnight and with no fines (no need in using Florida Ticket Firm, thanks God). We will spend the night at the Walmart in Portage, Indiana and check into a campground tomorrow. Day 56: Finding a campground at Indiana Dunes. 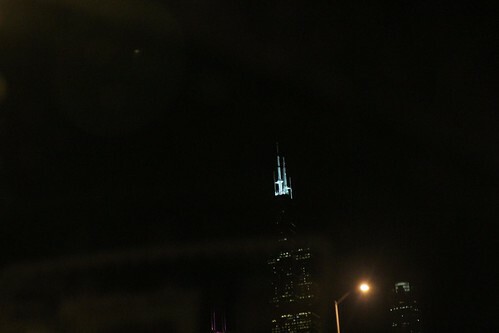 5 Responses to Day 55: Driving through Chicago at Night. Where in Kentucky are you headed? We are headed to Campbellsville, KY to work at Amazon.com for 2 months. Will be there October 3rd until sometime in December. hey Clarke, we are going to be in Louisville for Halloween. After that we are going to Tennessee near Knoxville. We should be in the vicinity of Campbellsville along the way at some point. Dan, I drove through Chicago with my Airstream during RUSH hour traffic. I was on my way to Sheboygan. talk about fun. In a way I did manage to camp in Chicago…. on the Dan Ryan Expressway! I can only imagine how crazy it must have been… How much did you shell out in tolls to get through to Wisconsin? Let me know when you are in, or near Campbellsville….we would love to meet ya’ll. We are just west of Louisville tonight at the Super Walmart at exit 105 off I-64….right near a Cracker Barrel!